I've booked the downstairs lounge of The Golden Guinea in Bristol for The Terror Scribes Meeting and book launch of Black Mirrors, The Night Eternal (by John B. Ford and Steve Lines) and the all new Terror Tales magazine on Saturday 5th May 2012. We've got the lounge all afternoon (from 12pm) and evening up until midnight. I'm sure a timetable of events will be drawn up prior to the event... We can take along our own music (iPods not CDs unfortunately) so hopefully we can hear some of the cool stuff Rainfall are releasing on record too! Unfortunately we couldn't hire the boat we wanted for the event as it has now transformed into The Apple and they don't hire. Such a shame. Still, we will be right next to the harbour, so there will be a chance to check out some of the boat bars -- including The Apple! And I'm reliably informed there is a very nice curry house nearby, as I hear the Terror Scribers are very partial to their curries! However, The Golden Guinea do serve food for those of you who don't want to stray too far from the venue. Please feel free to join us -- the event is completely free, so come along and sample Sailor Jerry's rum and(if you dare) Blackbeard's cider! It should be a great day/night. No boat? Is that because Captain Schettino isn't available? Such a shame about the boat Paul! It would have been brilliant. 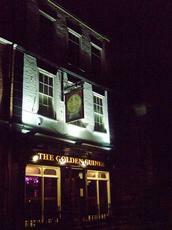 Still, The Golden Guinea sounds like a good little boozer. Just got to make sure I don't drink too many pints of Blackbeard's Cider, especially if I'm reading! !